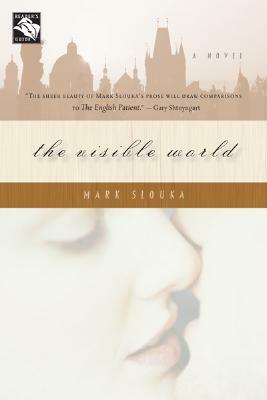 An immensely moving, powerfully romantic novel about the vagaries of love and the legacy of war, The Visible World is narrated by the American-born son of Czech immigrants. His New York childhood, lived in a boisterous community of the displaced, is suffused with stories: fragments of European history, Czech fairy tales, and family secrets gleaned from overheard conversations. Central in his young imagination is the heroic account of the seven Czech parachutists who, in 1942, assassinated a high-ranking Nazi. Yet one essential story has always evaded him: his mother's. He suspects she had a great wartime love, the loss of which bred a sadness that slowly engulfed her. As an adult, the narrator travels to Prague, hoping to piece together her hidden past. MARK SLOUKA is the author of the novels The Visible World, God’s Fool, named a Best Book of the Year by the San Francisco Chronicle, the short story collection Lost Lake, a New York Times Notable Book, and the nonfiction work War of the Worlds. Three of his essays have been selected for inclusion in The Best American Essays, and his short story “The Woodcarvers Tale” won the National Magazine Award for fiction. The Visible World is divided into three sections—"The New World: A Memoir," "Prague: Intermezzo," and "1942: A Novel"—each of which represents a different approach to the same essential story. Which section, do you think, is most "true"? Why? How do the three sections play off of each other to create a complex whole? The first section begins with the narrator stating, "I was born ... into a world that felt just slightly haunted." What haunts his family, his community? How do the ghosts of the past shape the course of the narrator's life? The narrator says of his childhood: "I collected the facts like a child hoping to build an oak from bits of bark." Do you believe that the narrator is ultimately able to reassemble a version of history that closely resembles the true events? How so or how not? Why does he try so earnestly to piece together the story? How would you characterize the relationship between the narrator's parents, Antonín and Ivana, as portrayed in "The New World: A Memoir"? How does the story told in the third section change or support the way you perceive their marriage? Do you think you would have made the same choices they did? How so or how not? Who is the more sympathetic character? In the New York Times Book Review, Eva Hoffman praised Slouka's investigation of "the uncertainties of cross-generational memory and the need to fill in the gaps." What compels us to construct stories out of our own histories? How does The Visible World illustrate this need? How have you made stories from your own personal or family history? How does The Visible World investigate the profound impact of secrecy, of information withheld, in love and in war? How are the lives of its characters shaped by what is known and what is unknown? The narrator describes the book's central relationship this way: "Theirs was a love story, and like any good love story, it left blood on the floor and wreckage in its wake." Who suffered most as a result of their love? Who lost the most? Would you describe theirs as a "good love story"? Why or why not? Fairy tales and literature figure prominently in the narrator's young life. How do these early stories resonate in his adult life? When streets in Prague's Old Town were inundated by floodwaters, first floors became cellars. In what way does this physical world buried beneath the present world work as metaphor? How can this idea of a hidden past be applied to storytelling, to truth, to the way history is recorded? How does it relate to the novel's title, The Visible World? Each of the characters encountered in the second section, "Prague: Intermezzo," offers a different memory of life in prewar and wartime Europe. How do you suppose the passage of time has altered these memories? How does the narrator apply the information he gathers in Prague to his reimagining of his parents' story? The narrator recalls: "I asked my father if he had ever been a hero. He said no, not even close to one, and because he was my father, I believed him." How might Antonín be regarded as a hero, in the 'memoir' and in the 'novel'? Why would he not have considered himself heroic? Do you think his son comes to regard him as such? What factors initially draw Tomáš and Ivana together? Do you believe the relationship would have lasted if it were not for the events of war? Why or why not? Do you agree with Antonín, who prays that Tomáš will live through the war so that habit can do its work and his and Ivana's love can "die on the field of days"? Tomáš and Ivana's love affair takes place in a setting seemingly far removed from the bleak realities of wartime. What does the near-mythical forest represent in the context of the novel? Why might the narrator have imagined the story this way? How does the lovers' last meeting in Prague contrast with their time in the forest? Antonín's friend Mirek suggests that Ivana will return to him when she grows tired of Tomáš. Antonín's reply is maybe, "and because he loved her as much as he did, he almost wished it could be otherwise." How did you interpret this almost-wish? What does it reveal about Antonín's love for Ivana, his regard for himself? The epigraph of The Visible World is taken from the poem "As I Walked Out One Evening" by W.ºH. Auden. How do Auden's lines resonate in Slouka's novel? The novel opens and ends with the same scene, that of Antonín getting dressed in the dark to go out and search for Ivana, who had gone for a walk in the forest at night. How does the context provided by the novel change how you perceive this scene? What emotions does it stir with each telling?